With the promise of great fuel efficiency and prices consumers could afford, in 2001 Honda introduced the Honda Fit. Right out of the gate, this five-door hatchback was well received and drivers reported few Honda Fit problems. In the United States and Canada, the Honda Fit was considered a subcompact, built on Honda's Global Small Car platform. Although production of the Honda Fit began in 2001, it didn't hit North American markets until 2006. Originally called the "Fitta," by 2006 this hatchback came with both automatic and manual transmissions, a 1.5-liter, 4-cylinder engine and all models have front wheel drive. It had a combined fuel efficiency of an amazing 30 miles per gallon. It was originally available in the base, sport, and sport with navigation models, but by 2009 more safety features were added along with a roomier interior. The 2009 model was four inches longer than prior model years. With more passenger space and its fold down rear seats, base model options included 15-inch steel wheels, air-conditioning, and a tilt telescoping steering wheel. Also standard on the base model was the CD/MP3 player. The navigation system was an option in the base model but was standard in the sport with navigation model. With pricing from $14,750 to $18,960, consumers who purchased a Honda Fit only noticed a few problems. According to Honda Problems, the two worst years for the Fit were 2007 and 2008 based on consumer complaints. In 2007, two main concerns came from road debris. First, at approximately 20,000 miles, the air-conditioning condenser in some models developed holes and needed a new o-ring. The second had to do with windshield problems and cracking. By 2008, it seemed more Honda Fit problems were noticed. Most common were engine, air-conditioning and heater problems, transmission concerns, and again, windshield cracking. Surprisingly, only two recalls were issued by Honda for model years 2007 and 2008 even though Honda Fit owners noticed other problems. For some models in 2007 and 2008, a front airbag recall was issued. On some 2007 models the owner's manual contained incorrect contact information for the National Highway Traffic Safety Administration (NHTSA). To date, no recalls have been issued for either the 2009 or the new 2010 Honda Fit models. 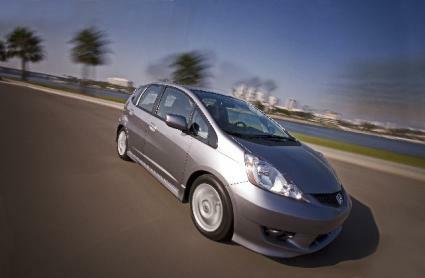 If you own a 2007 or 2008 Honda Fit, visit Honda's Owner Link where you can register for free. Once registered, you can supply your vehicle identification number or VIN and the Honda Owner Link will tell you if your vehicle has an open recall. Recall repairs are free to customers and can be performed at any authorized Honda repair center. You can also visit a Honda repair center and have them run a vehicle history report on your vehicle for more information on needed recall repairs. On 2010 models, Honda has upped the price range from $14,900 to $19,110. Along with that price boost comes features like Honda's satellite-linked navigation with voice recognition, iPod with USB interface, and ten cup holders. Honda says the 2010 Fit offers a "super-forward aero-form" exterior that enhances visibility and gives this subcompact a sporty stance. The vehicle has also achieved a five-star frontal crash test rating from the NHTSA. With a combined fuel economy of a whopping 33 miles per gallon and affordable pricing, experts don't anticipate any Honda Fit problems on the horizon. Especially since this vehicle has been well received with little complaints and only two recalls. Interested in a Honda Fit? Find out more at the Honda Fit Official Website.